Recently I don't hand quilt a lot and I thought of using my Grace Company quilting frame as a rack to display my antique quilts. I had searched for an antique rack or antique ladder, but did not find anything like that here. Unfortunately I don't think that this display is good looking with all those black screws and wheels. Let's say it is provisional until I find a proper rack. Waking up this morning I heared a strong wind and thought of my lovely fresh roses. 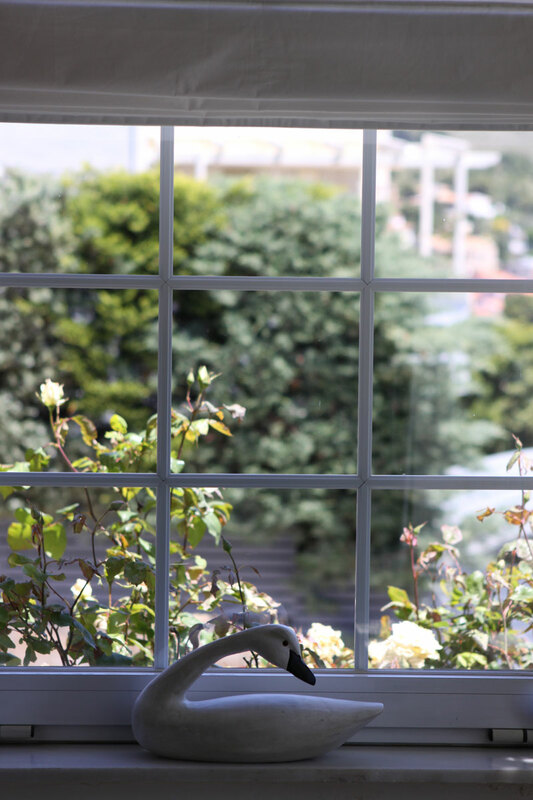 What a pitty, when I opened my bedroom window I saw the rose tree bending and the flowers getting damaged. 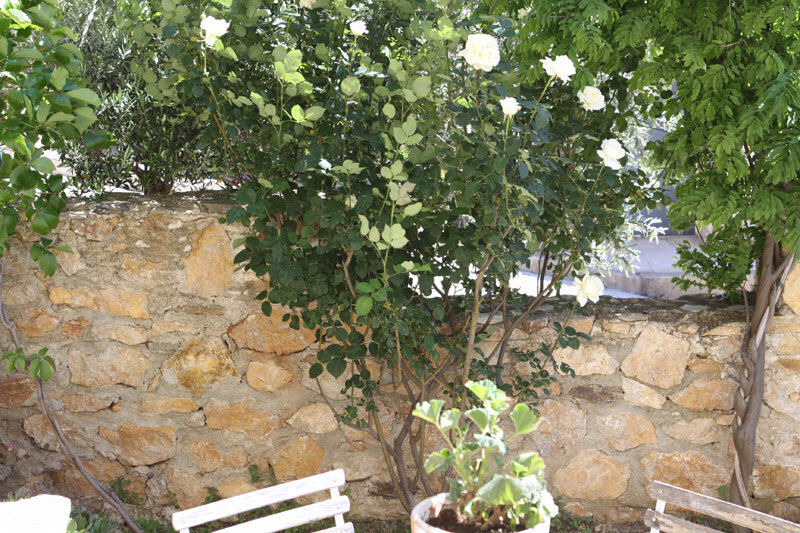 The climate here is rather harsh so that it's difficut to keep a beautiful garden, as after the wind will come the heat! I hope the rose tree that grew very high, and that we admire from the lounge will not be damaged! I hope it for you too ! A brilliant way to display your quilts while not using your frame!! Looks wonderful...and just LOOK at those quilts!! STUNNING!!! Fingers crossed for your roses!! What a pretty garden! I hardly noticed the quilt frame, your quilts are so beautiful!! We can get high winds here, I feel so bad for my flowers in the summer because they look like they have been beaten up after a wind storm. They usually recover after a few days. Your roses look lovely! It is nice to see quilts displayed. My daughter gave me display rack a while back, a white metal one (not old) she saw in a shop, I think it was supposed to a towel rack for a bathroom, but it is good for quilts. Never even noticed the black screws...too busy admiring that large scrappy star quilt with the mustard backing....love it!!! Such pretty quilts. Love the one with the pinks in the middle. Who's even looking at the rack when you have all of those wonderful antique quilts on them!! I think the quilting frame makes a very appropriate rack and it's such a better use for it when you are not quilting on it than to just have it folded up and stored away. 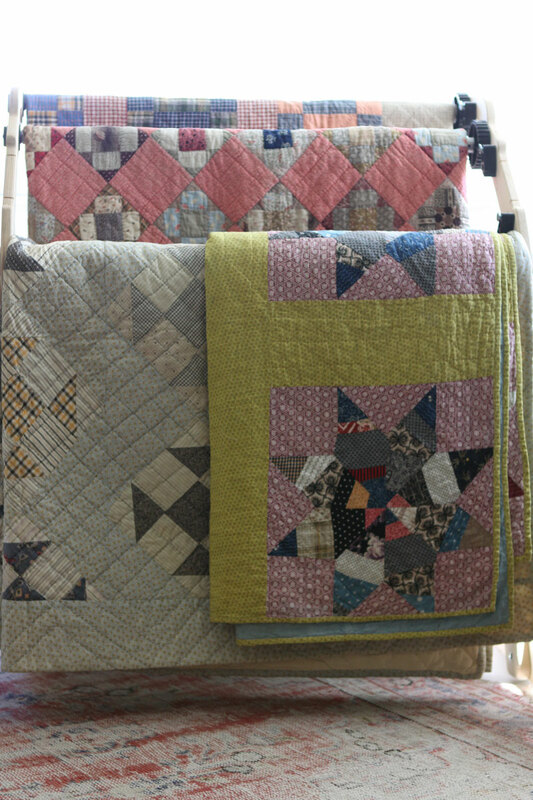 Got to go now and check out all the antique quilts you have posted to your blog! Thanks for sharing the link at Val's! Your quilts are awesome, they've been well loved over the years, the fabric's look so soft and inviting to touch. Displaying they on a quilting frame, even a modern one, is perfect the statement is that quilting will never die, it is alive and well in the 21 century. It is the best place to display, reminding you its always there when your going to use it for your next quilt top.
. I love your work and garden, I went out this morning to check and see how my flowers were doing, we had a bad storm last night, and another one on its way here this afternoon. My rose's didn't do so well they got hit pretty hard was doing, The zinna's and other flowers did fine,so far so good. Your picture with the antique quilts on your rack looks likes it comes straight from a magazine... bliss..